Qualcomm has launched the Snapdragon 712 SoC. It is a slightly upgraded variant of the Qualcomm Snapdragon 710. The performance gap between the two chipsets is as small as the gap between their names. The only significant difference is that the Qualcomm Snapdragon 712 has a 100MHz higher CPU clock than the Snapdragon 710. According to Qualcomm, the Snapdragon 712 offers 10% performance improvement over the Qualcomm Snapdragon 710. Let us have a look at what this new chipset has to offer. The Qualcomm Snapdragon 712 is mid-tier SoC, and it uses a 10nm LPP manufacturing process. It has eight Kryo 360 CPU cores clocked at up to 2.3GHz. For graphics, it has Adreno 616 GPU that can support up to QHD+ display and 4K HDR video playback. The chipset has support for up to 8GB of LPDDR4X RAM. The SoC supports Quick Charge 4+ fast charging. There are two Spectra 250 image signal processors that can handle up to dual 20MP, or a single 32MP camera. These image signal processors also have the capability to record 4K videos at 30 frames per second. 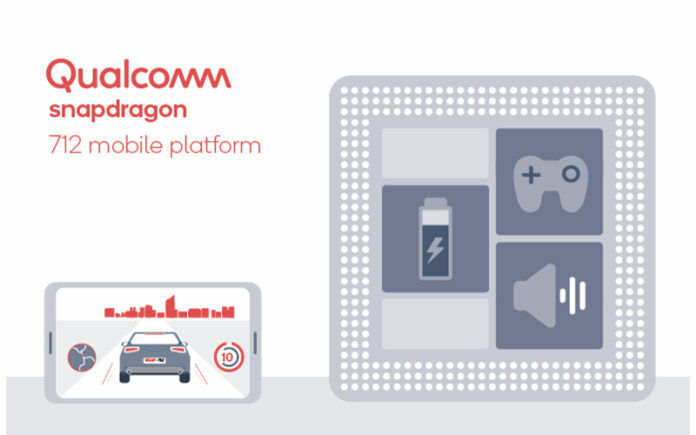 For connectivity, the Qualcomm Snapdragon 712 has Snapdragon X15 LTE modem that supports up to 800Mbps download, and 150Mbps upload speed. Other connectivity options include dual-band Wi-Fi ac with 2×2 MU-MIMO, Bluetooth v5.0, GPS (with Glonass, BeiDou, Galileo, QZSS, SBAS), and support for dual-SIM dual-VoLTE. For audio, the Qualcomm Snapdragon 712 has aptX, aptX HD, and aptX Classic codec support. There is also native DSD support for up to 384KHz/32-bit. Although the official specifications sheet says that the Snapdragon 712 has eight Kryo 360 CPU cores clocked at up to 2.3GHz, it is not all true. Snapdragon does not reveal full specifications of the CPU configuration. From what we know, there are two Kryo 360 Gold cores clocked at 2.3GHz, and six Kryo 360 Silver cores clocked at 1.8GHz. The Kryo 360 Gold cores are high-performance cores that kick-in only when more processing power is required. For the rest of the time, six Kryo 360 Silver cores handle most of the tasks. For your information, the Kryo 360 Gold core is basically a derivative of the Cortex-A75, and the Kryo 360 Silver is a derivative of the Cortex-A55. Currently, in the Indian market, you get smartphones with Qualcomm Snapdragon 660 at around INR 15,000. By spending a little more, say around INR 20,000, you will get a smartphone with Qualcomm’s flagship processor, which is the Snapdragon 845. So, there is a very little wiggle room for the Snapdragon 700 series chipsets. Apart from that, there is a lot of performance overlapping between the 600 and the 700 series Snapdragon processors. For example, the Snapdragon 660 has four high-performance cores, while the Snapdragon 710 has only two high-performance cores. So, this creates a lot of confusion not only for consumers but also for manufacturers. As a result, the Snapdragon 700 series is not quite popular as of now. I hope Qualcomm simplifies its processor line-up in the future.